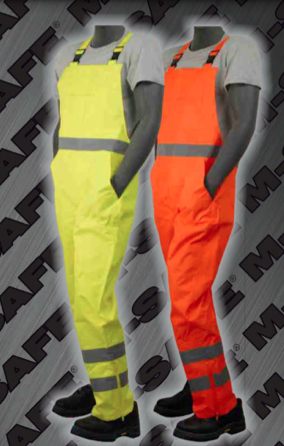 Looking to buy safety bib overalls in Rochester NY, Ithaca NY, and Western NY at competitive prices & with exceptional service? The Duke Company proudly carries the finest Safety Bib Overalls – ANSI 107-2010 Class 3 Bib Overalls in High Visibility Yellow and High Visibility Orange. Features high quality, long lasting plastic shoulder strap buckles. Bottom of legs are smartly designed with zippers. Strong snap closures ensure a tight fit at the ankles.